All the latest news about JB's Best Hearty Hot Sauce! august 3, 2015 -- help jb's best hearty hot sauce help a friend! MARCH 30, 2015 -- HAPPY ONE-YEAR BIRTHDAY TO US! As part of our one-year anniversary, we offered a free JB's Best T-shirt to anyone placing an order during our birthday week! Like proud parents watching their child smash his or her first birthday cake, we are astonished that an entire year has passed since we looked at each other and said, "Well, Dad always said, 'You don't stand a chance if you don't take a chance.' Let's do this!" Forget that more than half of all new businesses fail within the first 12 months of launching; JB's Best Hearty Hot Sauce not only has survived, we're thriving! And it's all because of the heartfelt prayers, enthusiastic support and appreciated well wishes from each and every one of you, our loyal and faithful friends. Once again, from the bottom of our hearts we thank you for all of your prayers and support, and hope you continue to enjoy, and help spread the word about, JB's Best Hearty Hot Sauce! March 8, 2015 -- Enjoy JB's Best Heary Hot Sauce at Coastal Breeze Seafood Grill! So proud and excited to welcome Coastal Breeze Seafood Grill in Buford, GA, into the JB's Best Hearty Hot Sauce family! A big thank you to owner Eric for enhancing his wings and other menu items with JB's Best! If you're in the Buford area, please stop in and check it out. Awesome food and great service! February 13, 2015 -- Race on over to The Famous Tomato in Indiana! Another proud achievement for JB's Best Hearty Hot Sauce! Big thanks to The Famous Tomato in Speedway, IN, for adding us to their shelves! If you're near Speedway, please stop in, grab a bottle and tell owner Michael Ray we said "hello!" December 18, 2014 -- Our very first written review! A great review of JB's Best Hearty Hot Sauce by our friend and fellow golf journalist and entertainment attorney Jay Flemma, who is also obviously a keen connoisseur of fine hot sauces! Thanks a bunch, Jay! Check out Jay's blog at A Walk in the Park. December 14, 2014 -- The Perfect Present: JB's Best Hearty Hot Sauce Gift Box! Heat up your Cyber Monday with the new JB's Best Hearty Hot Sauce Gift Box! The perfect gift for your friends and family who would love to add some spice to their Holiday season: Two 10-oz.bottles of JB's Best, one 1.75-oz. travel bottle (perfect for taking to work or your favorite restaurant! ), one custom Koozie, one cool bottle opener and a personalized note -- plus FREE SHIPPING! Click here to order yours today! 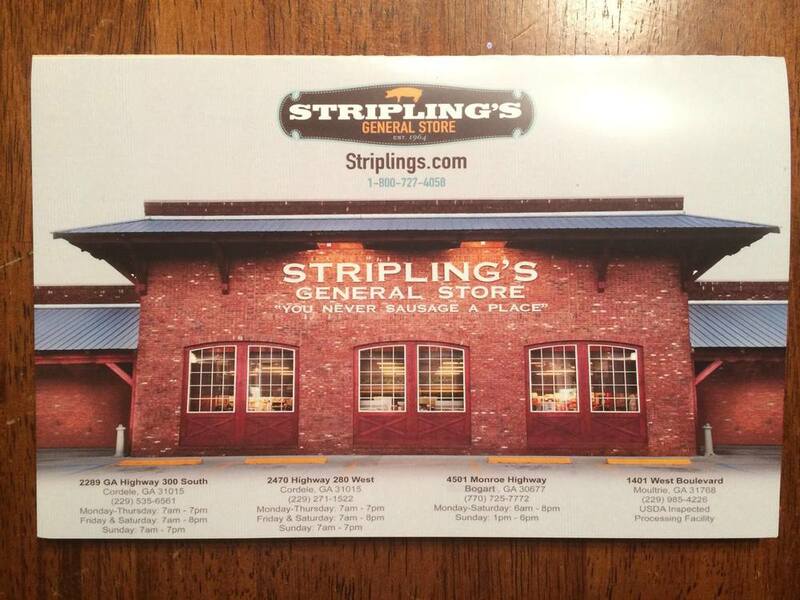 November 28, 2104 -- JB's Best Hearty Hot Sauce now available at Stripling's! Proud and excited to announce the newest retail location for JB's Best Hearty Hot Sauce! Thanks to co-owner Andrea Camp for putting us on the shelf at her Stripling's General Store in Bogart, GA, at the intersection of Hwy. 78 and Hwy. 53! November 19, 2014 -- A most scrumptous dinner at JB's House! Tonight's dinner at JB's home: Potato Pierogies (boiled; you can get them from your local grocery store) topped with chopped onions sauteed in butter, chopped chives, crisp bacon pieces, shredded cheddar cheese, a dollop of cool sour cream and drizzled with, what else, JB's Best Hearty Hot Sauce! Talk about yummy in your tummy! October 14, 2014 -- Another batch of JB's Best Goodness is Born! A big thanks to Tim Piccolo and Piccolo's Italian Steakhouse in Watkinsville, GA, for their generosity and hospitality! Go ahead and getcha some! You know you want to! August 31, 2014 -- You need to try this awesome breakfast! This morning's breakfast: Scrambled eggs with diced Honeybaked Ham, pepperoni and cheese topped with a healthy dousing of JB's Best Hearty Hot Sauce and served in a warm, soft, flour tortilla shell. Try it for yourself because words cannot describe how yummy it was! July 15, 2015 -- Plenty of JB's Best Yumminess at Picollo's! Talk about a tasty lunch special. Tim Picollo, proprietor of Picollo's Italian Steakhouse in Watkinsville, GA, served up this dish today for his customers: JB's Best Chicken Flatbread Pizza! Ranch dressing, grilled chicken, chopped red onion, crispy bacon, mozzarella cheese, Parmesean cheese, and with JB's Best Hearty Hot Sauce drizzled on top! Delish! Why not try it at home for yourself and your family? July 10, 2014 -- A big welcome to Italy's Pizza and Pasta! If you live in the Hamilton Mill area north of Atlanta, please stop in and check out the menu at Italy's Pizza and Pasta on Hamilton Mill Parkway, near the Walmart. They have great pizza, authentic Italian pasta dishes and now -- thanks to Oliver, the owner -- JB's Best Hearty Hot Sauce! May 31, 2014 -- Time to Celebrate 200! Thanks to our great friend and former Turner Sports colleague Jim Beahm, we have surpassed 200 likes on our JB's Best Hearty Hot Sauce Facebook page! Thanks, Jim! If you haven't done so already, please click that like button and tell all of your friends and family to do the same! April 27, 2014 -- Our First Festival! The last Sunday in April proved to be a first for JB's Best Hearty Hot Sauce. After purchasing our first 10x10 canopy tent, 8-foot custom outdoor banner and 8-foot folding table, plus crafting together a few accessories, we loaded up the SUV and headed for the St. Matthew Catholic Church Spring Festival in Winder, GA. Under glorious sunny skies and aided by JB's beautiful and faithful neices, we met many new friends and sold a few bottles of our sauce. Everyone who tried a free sample was very impressed and gave us many positive comments. More than encouraged, we look forward to our next opportunity. April 14, 2014 -- Our First Retail Location! A proud day at JB's Best Hearty Hot Sauce as we are featured in our first retail outlet! A big thanks to S&S Ace Hardware and Mower in Braselton, GA! The popular home improvement store features a large display of outdoor grills and smokers, including Big Green Eggs, and we are now on the top shelf. If you live in the Braselton area, please stop by and tell the good folks there hello for us!